Dimensional Sculptured Skulls with candles that flicker, it gives your home or haunt the spooky atmosphere that you have been searching for at an unbelievably affordable price! Skull Candle Curtain is a great addition to your Halloween decorations, Haunt or Costume party. 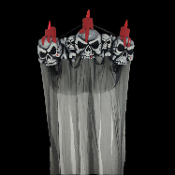 At almost 7 feet in height, the Skull Curtain is a devilishly creepy way to greet guests at your castle entry. Each skull approx 7-inch (17.5cm) wide. Each bulb approx 3-inch (7.5cm) high x 1-inch (2.5cm) wide. Uses AA Batteries, Demo Battries Included. Buy several to adorn the entry to your dungeon. Each Skull Curtain made of dense foam and sheer shrouded cloth draping. Great to display in pairs across your picture window, in hallway or entry!